Membership | Kappa Kappa Kappa, Inc.
What does it take to be a Tri Kappa? Tri Kappa is unique in that it is a Greek organization located only within the boundaries of the state of Indiana. It is larger than most Greek organizations with national membership—both in number of members and number of chapters. What are the works of its members? Each Active Tri Kappa Chapter annually includes work promoting charity, culture, and education. This work incorporates moneymaking projects and community volunteer efforts. Tri Kappa is an “invitation only” sorority. A potential member must be invited by an Active sister in the local chapter. A Pledge is allowed into our Tri Kappa sorority by a secret ballot vote. The object of this organization shall be to bring women into close, unselfish relationship for the promotion of charity, culture, and education. How are Tri Kappa's Chapters Governed? Tri Kappa chapters are governed by a State Convention and State Council consisting of five members. Chapters abide by a set of State Bylaws and also by a set of Bylaws written by the Chapter themselves. Many of our chapters are incorporated. Tri Kappa is a 501 (c) (3) organization. What is the size of its membership? Kappa Kappa Kappa is a thriving Greek sorority made up of approximately 8,179 women in 143 Active Chapters and 104 Associate Chapters. Find a Chapter here! An Active member is one who is duly initiated into an active chapter and who participates in the work of the active chapter. A College member is a member of an active chapter who is a full-time student for at least nine months of the year. Honorary membership is no longer granted. Those named prior to April 29, 1983 can retain their honorary status. An Associate member is one who has been duly initiated into an active chapter, who has given a minimum of ten years of active service, and who, having ceased to be a member of an active chapter, participates in the work of an associate chapter. A Key member is any member who has given a minimum of ten years of service, is required to attend five meetings each term, and has full voting privileges. A Sustaining member is any member who has given a minimum of fifteen years of service. She relinquishes all voting rights but may attend chapter functions. She has the option to reside out of state. 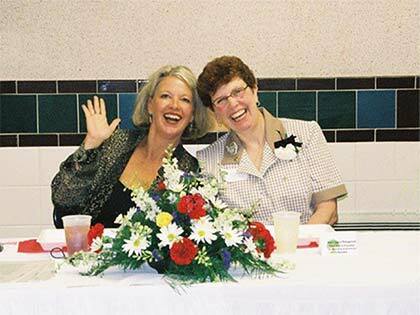 Karen VanDuyn (L) and Mary Jane Polsgrove (R) - Province X Convention, Fall 2004.